LED screen is coated with epoxy, thus it is water-proof, dust-resistant and shock-proof. ;10V; or it will display the voltage to 0.1V when over 10V. Has black and red wire to connect, with reverse polarity protection. Can be fixed with two holes on each side. Widely used in automobile, motorcycle and other rugged environment. 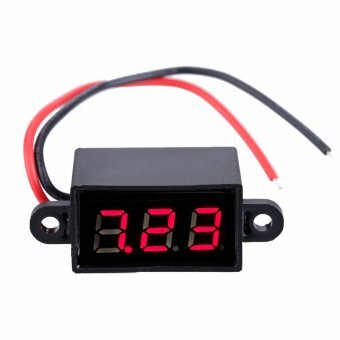 This is a very practical mini voltmeter, portable, water-proof,dust-resistant and shock-proof. It has 2 wires to connect and has reverse polarity protection. Clearly display the testing results in the LED screen and can be widely used in automobile, motorcycle and other rugged environment. You should own it to make your work easier. High-accuracy: adjust the accuracy automatically: it will display the voltage to 0.01V when it under 10V; or it will display the voltage to 0.1V when over 10V.